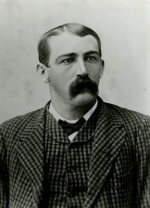 American author Andy Adams lived as a real cowboy and gold miner. Then he wrote seven books. A history of the cattle drives north from Texas after the Civil War. Read for free online at Internet Archive. An account of the author’s experiences as a cowboy after the Civil War as Texas cattle were driven to the north to be finished for market on the plains that had been cleared of buffalo. Read for free online at HathiTrust. A collection of stories about cow punching in the old West. Read for free online at Internet Archive.